Yesterday, I got the word from Netflix: "We shipped My Name is Earl Season 3: Disc 1." I've been waiting for this since forever. 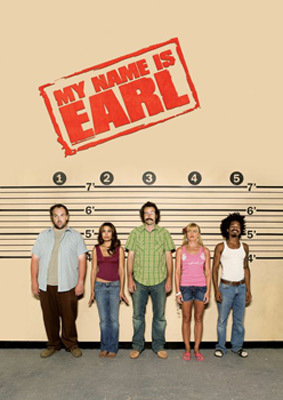 Last winter, I decided to finally get on the Earl train and, with Netflix's obliging help, managed to mainline the first 2 seasons fairly quickly with lots of laughing and a whole new respect for Jaime Pressly. However, by the time I watched "The Trial," there was no way to catch up with season 3, so I did what any tvhound would do in this situation: shrug and queue up for the DVDs. I queued up for DVDs that I fully expected to come out over the summer, just like most sensible television show DVDs do. The totally stupid thing was, Netflix didn't have the season three DVDs until...September 30th? September 30th! When season 4 started airing on September 25th?! How is that EVEN rational? The whole point of Netflix (for me) is renting movies I'm too annoyed to see in public theaters and catching up on television shows before a new season debuts! Most shows understand that concept. Veronica Mars did. 30 Rock did. So, what the hell, Earl? Now, in this new age of online television viewing, you'd THINK I'd be able to catch up on Earl via NBC's site or, at the very least, on Hulu, which is owned by NBC. But you'd be wrong. All the livelong summer, both sites hosted only part of season 3, and the partial began in the middle-to-end of the season, not the beginning. Of course, once Earl's season 3 DVDs were released at Netflix, there was a long wait for the 4 discs. I kept all of them at the top of my list and promoted random movies one by one -- The Tenant of Wildfell Hall (depressing, disturbing, typical Brontë), These Girls (weird, Boreanaz, Canadian), etc. -- until they were ready. I also started TiVO-banking season 4. Finally, Earl's discs 2 and 3 of were available, but since there was still a "short wait" for discs 1 and 4, I was forced to do the only thing I could do in such a desperate situation: I got disks 2 and 3 and am now hoarding them until disc 1 arrives, hopefully later today. So, for all you Bay Areans waiting for your 3rd season Earl fix, discs 1 and 2 will be back in circulation mid-week. Man, Earl, season 3 better be worth it! *Ironically, Earl is FULL of Kecklers!